Br Khalil Ali passed away peacefully on Sunday September 9th, 2018 at the Scarborough General Hospital. He was 80 years of age and originally from Metenmeerzorg, West Coast Demerara, Republic of Guyana. He was the Husband of Sr. Meena. He was the Father of Nazalene, Afshan, Kemal and Nyron. He was the Brother-In-Law of Br Feroze, Affrose, Boen, Faizul, Sheila and Shakeela. Br Khalil was the past President of the Sunatul Jamaat of Ontario - a position he served in for over twenty years. Sheik Hidaiyat Husein known as Amo or Nick passed away in London, England on December 13, 2017. Sheik Hidaiyat Husein was the son of the late Hajji Sheik Abdul Aziz Hosein (Mannie Sheik) and Hajjin Gulzafri Hosein of Goed Bananen Land, East Canje, Berbice, Guyana. Rasheeda Ali, Sheik Farouk Husein, Kalifa Rajnarine (England), Feeza Johnson (USA) and Sheik Zaf Husein (Canada). He was the devoted and loving father to Nicola Ayesha Woodhead and Deen Husein. Father-in-law to Mathew and Allison. Grandfather to Jack Deen, Nicholas Aziz, Rianna Yasmin, Shannon Aisha and Natasha Farah. Sr. Sairah Karim passed away peacefully on Friday December 22nd, 2017 at the Trillium Hospital, Mississauga. She was 90 years old and is formerly from Middle Rd, La Penitance, Georgetown, Republic of Guyana. She was the Daughter of the late Jainab Ali (of Middle Rd, La Penitance). She was the Wife of the late Joseph Karim. She was the Mother of Faizal Karim and Hanif Karim. She was the Sister of Nazmoon Ali, Usman Ali, Jack Ali and Hasan Ali. She was the Grandmother of Farrah Karim, Cheryl Karim and Omar Karim and Great Grandmother of Aara Jetha and Nayan Jetha. Sr. Zabida Hassan passed away peacefully on Thursday December 21st, 2017 at 1:15am at the Humber River Hospital, Etobicoke. She was 87 years old and is formerly from Georgetown, Republic of Guyana. She was the Wife of the late Sheik Nazerool Hassan (Baboo). She was the Mother of Bibi Rehanna Hassan, Bibi Ameena Kassim, Bibi Jameela Ahad and Sheik Hassan (David). She was the Sister of Buddy Hassan, Sonny Mohamed and Nazmoon Khan. She was the Grandmother of 9 and Great Grandmother of 3. 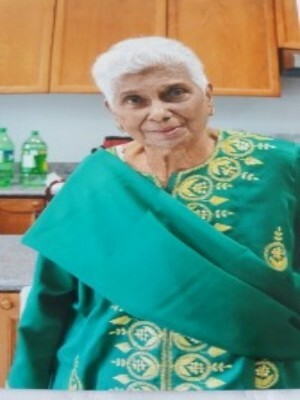 It is with profound sadness that I announce the passing of Sr. Rajpaty Sooknanan who left this world on Monday December 18th 2017 at approximately 9:30am. She was 84 years of age and is originally from Vergenoegen, West Coast Demerara, Republic of Guyana. She was the mother of our very close friend and brother, Br. Roy Sooknanan from the Imdadul Islamic Center. She was the Sister of Poach and grandmother and great grandmother of many. Br. Whazeer Ally (Wazo) passed away peacefully on Tuesday December 12th 2017 shortly after 6:00pm at the Peterborough Heath Center in Peterborough, ON. He was 57 years of age and is originally from Lima, Essequibo, Republic of Guyana. He was the Son of Shandan Ally and the late Tajiran Ally. He was the Father of Al Muzammil, Al Mudassar, Waseela and one more (information was not available). He was the Brother of Nazeerah, Nazneen, Bee, Shah, Malgena, Shafek, Imytiaz, Chazam and Redwana (formerly of IMO). Br. Whazeer Ally (Wazo) leaves behind many nieces and nephews. He was the Husband of Zairul Khan. He was the Father of Bibi, Fazrul, Fazeela, Sadeeka, Zulieka, Rehana, Swabera and the late Zorina. He was the Uncle of Shaikh Moeenul Hack.